Recent advances and emerging technologies for metabolic pathway engineering and synthetic biology have transformed the field of natural product discovery, production, and engineering. Despite these advancements, there remain many challenges in understanding how biosynthetic gene clusters are silenced or activated, including changes in the transcription of key biosynthetic and regulatory genes. This knowledge gap is highlighted by the success and failed attempts of manipulating regulatory genes within biosynthetic gene clusters in both native producers and heterologous hosts. These complexities make the choice of native producers versus heterologous hosts, fermentation medium, and supply of precursors crucial factors in achieving the production of the target natural products and engineering designer analogs. Nature continues to serve as inspiration for filling the knowledge gaps and developing new research strategies. By exploiting the evolutionary power of nature, alternative producers, with the desired genetic amenability and higher titers of the target natural products, and new strains, harboring gene clusters that encode evolutionary optimized congeners of the targeted natural product scaffolds, can be discovered. These newly identified strains can serve as an outstanding biotechnology platform for the engineered production of sufficient quantities of the target natural products and their analogs, enabling biosynthetic studies and potential therapeutic applications. These challenges and opportunities are showcased herein using fredericamycin, iso-migrastatin, platencin and platensimycin, the enediynes of C-1027, tiancimycin, and yangpumicin, and the leinamycin family of natural products. Natural products have been a source of inspiration for both chemists and biologists due to their unique, complex structures and vast biological activities. More than 70% of the antibacterial or anticancer drugs currently on the market are natural products and their analogs or derived from and inspired by natural products . Despite this outstanding track record, since the end of the twentieth century, natural product isolation programs have significantly decreased with the rise of combinatorial synthesis and high-throughput screening (HTS) . Moreover, the discovery of natural products is often hindered by low quantities, poor growth characteristics of the producers, or the inability to cultivate the bacterial strains of interest within a laboratory setting [49, 58]. Advancements in microbial genomics have shown that, in Actinobacteria, approximately 90% of biosynthetic capacity has not been realized . Continued advancement and emerging technologies in bioinformatics, microbial genomics, metabolic pathway engineering, and synthetic biology are poised to place us at the forefront of a new age of natural product discovery and drug development [36, 41]. Genome mining efforts, enabled by advancements in DNA sequencing and bioinformatics, have allowed for the identification and prioritization of bacterial strains, harboring biosynthetic gene clusters that encode privileged natural product scaffolds and/or novel chemistries, for discovery. The challenges lie in activating the identified biosynthetic gene clusters for natural product discovery. Two complementary approaches have been commonly considered—(i) activating the gene cluster in the native producer, which may require genetic technologies that are not readily available, or (ii) expressing the gene cluster in a heterologous model host, which can take advantage of the expedient genetic tools developed. While applications of the common engineering technologies to manipulate gene expression are generally easier in heterologous hosts, the natural regulatory pathways between the native producers and the gene cluster are severed upon transfer of the gene cluster out of its native producer. Conceptually, one could imagine developing a “universal” system for producing natural products, in which any biosynthetic gene cluster could be introduced into a genetically tractable and high producing chassis tailored to a desired natural product of interest. However, despite great effort and access to many of the emerging engineering tools, many challenges remain. Even with enabling technologies to sequence DNA, and clone and express biosynthetic gene clusters in various heterologous hosts (Fig. 1), the feasibility and practicality of a universal system is currently unattainable due to a gap in knowledge of natural product production between native producers and heterologous hosts. Recent studies, such as a so-called “pressure test” to produce ten natural products in 90 days , highlight this knowledge gap and demonstrate how little we truly know about interactions between biosynthetic gene clusters and host regulatory systems. Successful examples of heterologous production of natural products are dominated by small, low-complexity gene clusters, with few operons, with exceptions seen only on a case-by-case basis. Therefore, the notion that heterologous expression of biosynthetic gene clusters can systematically facilitate natural product production is far from reality. There are two types of strategies that one could implement to activate biosynthetic pathways—(i) epigenetic related and (ii) genomics based. Epigenetic approaches rely on modifying culture conditions, interspecies cross talk, stressors, external cues, and environmental and nutritional factors, while genomic-based approaches utilize genome mining, genetic manipulation, and heterologous expression [41, 49, 58]. One genomics-based strategy, discussed herein, to coax production from a biosynthetic gene cluster is overexpression and deletion of regulatory genes. There are three types of regulators within Streptomyces—(i) global regulators that are responsible for morphological differentiation and secondary metabolite production, (ii) pleiotropic regulators that control the production of multiple downstream pathways, and (iii) pathway-specific regulators that govern the titers of a particular compound or set of related compounds from the same gene cluster [4, 33]. These regulators compose large networks and signal transduction pathways that are unique to each producer and govern their own set of biosynthetic gene clusters. This hierarchical nature of the regulatory networks that govern secondary metabolism introduces complexities for activation of biosynthetic gene clusters in heterologous hosts. Upon transfer of a biosynthetic gene cluster from a native producer to a heterologous host, these regulatory networks may be severed and disrupted. Comparing the gene expression for key biosynthetic or regulatory genes in native producers and heterologous hosts, therefore, could shed light on these intricate networks. The following three examples, using natural products fredericamycin A (FDM A), iso-migrastatin (iso-MGS), and platensimycin (PTM) and platencin (PTN), highlight the important roles played by regulatory networks in engineered production of natural products. FDM A, first isolated in 1981 from Streptomyces griseus ATCC 49,344 , features a novel spiro carbon center joining two peri-hydroxy tricyclic aromatic moieties [28, 42] (Fig. 2a); the polyketide origin of the pentadecaketide skeleton of FDM A was subsequently established by isotope labeling experiments . The novel structural features and potent antitumor activity of FDM A inspired efforts to study its biosynthesis, improve production, and generate analogs by metabolic pathway engineering. The 25-kb fdm gene cluster, consisting of 28 genes, was identified and cloned from S. griseus ATCC 49344 (Fig. 2b) and introduced into two heterologous hosts, Streptomyces albus J1074 and Streptomyces lividans K4-114 . While no FDM A production was detected in S. lividans K4-114, expression of the fdm cluster in S. albus J1074 afforded FDM A in a titer of 130 mg/L, in comparison to 170 mg/L in the native producer, serving as a starting point for engineered production of FDM A [4, 48]. To increase FDM A production, either in the native producer or heterologous hosts, three putative regulatory genes, fdmR, fdmR1, and fdmR2, were identified within the fdm cluster. FdmR1 belongs to the Streptomyces antibiotic regulatory protein (SARP) family of regulators consisting of both pathway-specific and pleiotropic regulators . Inactivation of fdmR1 in S. griseus ATCC 49344 abolished production of FDM A, which could be restored upon genetic complementation. Real-time polymerase chain reaction (RT-PCR) analysis of the effects of ΔfdmR1 inactivation revealed the silencing of five biosynthetic genes (fdmF, fdmL, fdmO, fdmS, and fdmV) and significantly reduced the transcription of four other pathway-related genes (fdmC, fdmR2, fdmU, and fdmW). These findings established FdmR1 as a pathway-specific positive regulator for FDM A biosynthesis in S. griseus ATCC 49344 and encouraged the overexpression of fdmR1 for FDM A titer improvement and structural diversity in both the native and heterologous hosts . Overexpression of fdmR1 indeed resulted in an increased production of FDM A in the native producer or activation of the fdm gene cluster in the heterologous hosts, albeit at significantly different levels between the native producer and the heterologous hosts . In the native producer S. griseus ATCC 49344, fdmR1 overexpression resulted in a sixfold titer improvement for FDM A to ~ 1 g/L (Fig. 2c). However, activation of FDM A production in S. lividans K4-114, in which the fdm gene cluster was apparently silent, resulted in a low FDM A titer (0.5 mg/L); the titer was improved upon placing fdmR1 under the control of the constitutive ErmE* promoter, increasing the FDM A titer threefold to 1.4 mg/L (Fig. 2c) . Although FDM A biosynthesis was activated in S. lividans K4-114, the resulting titers were much lower than that in the native producer S. griseus ATCC 49344 or the heterologous host S. albus J1074 (Fig. 2c). Subsequent comparison by RT-PCR of the transcription levels of the fdm genes between the native producer and the heterologous hosts identified fdmC, a ketoreductase, as the bottleneck in FDM A production; co-overexpression of fdmC and fdmR1 in S. lividans ultimately resulted in a 12-fold increase in FDM A titer to 17 mg/L (Fig. 2d) . Overall, manipulation of regulatory genes can greatly assist in gene cluster activation and increasing the production of natural products. However, this example, and many other examples not mentioned here, highlight how regulatory system alteration, upon gene cluster transfer into heterologous hosts, can result in diminished production or differences in gene transcription levels. This authenticates the notion that regulatory genes that govern secondary metabolism, whether global or pathway-specific, are part of a complex network that complicates rational metabolic pathway engineering and refactoring in both native and heterologous hosts. Dorrigocins A and B, first isolated in 1994 from Streptomyces platensis subsp. rosaceus strain AB1981F-75 to inhibit a carboxyl methyltransferase involved in cellular signal transduction via processing of Ras-related proteins [18, 22], belong to the glutarimide-containing polyketide family of natural products. Other members of this family of natural products include migrastatin (MGS), isolated from Streptomyces sp. MK929-43F1 in 2000 and shown to inhibit cell migration , and iso-migrastatin (iso-MGS), isolated from S. platensis NRRL18993 in 2002 , which was also known as an MGS producer. Subsequent investigation of MGS and iso-MGS biosynthesis in S. platensis NRRL18993 established iso-MGS as the nascent natural product encoded by the mgs biosynthetic gene cluster, with dorrigocin A and B, as well as MGS, as shunt metabolites of iso-MGS formed during isolation (Fig. 3a) [19, 20, 21, 25]. The 65-kb mgs gene cluster, consisting of 11 genes, was cloned from S. platensis NRRL 18993 and introduced into five heterologous hosts, i.e., S. albus J1074, S. lividans K4-114, S. coelicolor M512, S. avermitilis SUKA4, and S. avermitilis SUKA5, for iso-MGS production, fermented in three different media, i.e., B2, R2YE, and R2YE (Fig. 3b) . iso-MGS production was observed in all five hosts under the three media examined albeit with varying titers [51, 55] (Fig. 3c). Differences in the production of iso-MGS among the five heterologous hosts, in the three different media, suggest that in addition to severing regulatory networks, the choice of media could also play an important role in activation of the mgs gene cluster in the heterologous hosts. This is further highlighted by the increased expression of 10 of the 11 genes in the mgs gene cluster, as revealed by RT-PCR, in S. albus J1074 when fermented in R2YE medium compared to the other media [51, 55]. There are many reasons as to why this may occur, including competing biosynthetic pathways, precursor availability, and the roles the promoters and regulators may play, demonstrating the importance in the choice of heterologous host and medium. Currently, there are no general guidelines to predict which combinations will be most fruitful for natural product production. To increase iso-MGS production, the msgA regulator was identified within the mgs gene cluster from the native producer S. platensis NRRL 18993 [25, 51]. Bioinformatics analysis revealed that MgsA belonged to the family of “PimR-like” SARP regulators , inactivation of which in S. platensis NRRL 18993 completely abolished iso-MGS production, establishing its essential role in regulating iso-MGS biosynthesis . However, overexpression of mgsA, alone or under the constitutive ErmE* promoter, in either the native producer or the five heterologous hosts, showed no titer improvement for iso-MGS, suggesting that MgsA is not the rate-limiting factor controlling iso-MGS biosynthesis. More interestingly, transcription of mgsA could not be detected by RT-PCR from all five heterologous hosts, despite the fact that mgsA was essential for iso-MGS production in the native producer S. platensis NRRL 18993 . Of note, when the mgs gene cluster was compared with two other glutarimide-containing polyketide gene clusters, lactimidomycin (LTM) from Streptomyces amphibiosporus ATCC 53964 and cycloheximide (CHX) from Streptomyces sp. YIM 56141, it was realized that the chx gene cluster, consisting of ten genes, also contained an MgsA homolog, ChxA, while the ltm gene cluster, consisting of nine genes, lacked a MgsA homolog or any apparent regulators . This raises the question as to why only some gene clusters have pathway-specific regulators and why activation or inactivation of positive or negative regulators, respectively, does not always correlate with the titers of the target natural products. Taken together, this implies there are differences in the regulatory networks between the native producers and heterologous hosts, as well as between heterologous hosts, thus adding another layer of complexity when deciding which heterologous host to use. This knowledge gap in understanding how biosynthetic gene clusters interact with the rest of the genomes, either in the native producers or heterologous hosts, limits our ability to activate gene clusters by rational metabolic pathway engineering for natural product production in general. Platensimycin (PTM), first discovered in 2006 from S. platensis MA7327, is a hybrid natural product containing a substituted benzoic acid and diterpenoid-derived ketolide connected via an amide bond (Fig. 4a) [15, 46]. PTM was shown to target bacterial type II fatty acid synthesis (FASII) by inhibiting the FabF/B subunits . Platencin (PTN) was discovered a year late from S. platensis MA7339, which differs from PTM only in the ketolide portion of the molecule but targets FASII by dual inhibition of the FabF/B and FabH subunits (Fig. 4a) . Despite their structural novelty, potent activity, and the unprecedented mode of action, the low titers of PTM (~ 2–4 mg/L) and PTN (~ 1 mg/L) in the native producers hindered their further biosynthetic studies and biological evaluation. To improve PTM and PTN production, both the 47-kb ptm gene cluster, consisting of 36 genes, and the 41-kb ptn gene cluster, consisting of 31 genes, were identified and cloned from S. platensis MA7327 and S. platensis MA7339, respectively, remarkably confirming that the ptm gene cluster from S. platensis MA7327 in fact encoded the biosynthesis of both PTM and PTN, i.e., S. platensis MA7327 as a PTM and PTN dual producer . Within the ptm and ptn clusters were identified ptmR1 and ptnR1, respectively, encoding members of the GntR family of pathway-specific repressors. Inactivation of ptmR1 in S. platensis MA7327 afforded two ΔptmR1 mutant strains SB12001 and SB12002 that overproduced PTM and PTN, respectively, in titers of 323 and 255 mg/L, which represented more than 100-fold increase over the native producer . Similar inactivation of ptnR1 in S. platensis MA7339 afforded the ΔptnR1 mutant strain SB12600 that overproduced PTN in a titer of 22 mg/L, which also represented a major improvement over the native producer but was significantly lower than the PTN titer in SB12002 . Subsequent examination of the metabolite profile revealed that SB12600 accumulated many PTN biosynthetic intermediates, which apparently cannot be converted to PTN, accounting for the reduced overall titer of PTN in SB12600 . Unfortunately, both the ΔptmR and ΔptnR overproducers failed to sporulate, forfeiting additional efforts to engineer the PTM and PTN biosynthetic machinery in the native producers for further titer improvement and structural diversity [39, 40, 56]. To circumvent the difficulty encountered in engineering PMT and PTN biosynthesis in their native producers and shed light into the regulatory network controlling the metabolic pathway flux for PTN biosynthesis, the 41-kb ptn cluster was cloned from S. platensis MA7339  and introduced into five Streptomyces hosts, i.e., S. coelicolor CH999, S. coelicolor M1146, S. coelicolor M1154, S. lividans K4-114, and S. albus J1074, however, resulting in no production of PTN in any of the heterologous hosts (Fig. 4b) . PTN production was only observed in S. lividans K4-114 upon inactivation of ptnR1. The resultant ΔptnR mutant strain SB12606 suffered from very low PTN titer of ~ 1 mg/L with the concomitant accumulation of larger quantities of biosynthetic intermediates and shunt metabolites, an observation reminiscent to the stalled biosynthesis of PTN in the ΔptnR mutant of S. platensis MA7339 (Fig. 4c) . While accumulated biosynthetic intermediates and shunt metabolites provided insight into the PTN biosynthetic pathway, they highlight how inactivation of pathway-specific repressors may lead to pathway activation and natural product production but also could adversely disrupt metabolic pathway flux and balance, thereby stalling biosynthesis and accumulating side products and shunt metabolites instead of the target natural products. Comparison by RT-PCR of the transcription profiles of the two ΔptnR1 mutant strains, S. platensis SB12600 and S. lividans SB12606, which produces PTN with titers of 22 and 1 mg/L, respectively, revealed different gene expression profiles [38, 56]. The fact that removal of a repressor can lead to differences in transcription levels of each gene, in a host-specific manner, gives rise to another level of complexity that remains poorly understood currently. Although there is a lack of knowledge on how biosynthetic gene clusters, regulatory genes, and hosts interact to enhance or silence the production of natural products, there are ways in which we can overcome these challenges by exploiting nature’s power of evolution. Nature has incorporated numerous gene clusters, into multiple strains, allowing for the identification of alternative producing strains to afford the target natural products, as well as evolutionarily optimized structural analogs, in higher titers. Genome mining of a diverse strain collection could facilitate the targeted discovery of novel scaffolds and analogs for natural product discovery and structural diversity. Comparative studies of gene clusters, encoding the biosynthesis of a family of natural products, sharing a common scaffold, promise to teach us how nature does combinatorial biosynthesis at its best. Three examples, PTM, the enediyne natural products of C-1027, tiancimycin A (TNM A), and yangpumicin A (YPM A), and the leinamycin (LNM) family of natural products, are discussed herein to highlight how to exploit the evolutionary power of nature for the discovery of alternative producers of known natural products, with the desired growth characteristics, genetic amenability, and higher titers, and new producers encoding the designer analogs of targeted natural product scaffolds. Metabolic pathway engineering and combinatorial biosynthesis rely on the ability to genetically manipulate the producers and metabolite titers efficiently for isolation . As exemplified by PTM and PTN, the native producers S. platensis MA7339 and S. platensis MA7327 suffered from the low titers, and PTM and PTN, as well as selected biosynthetic intermediates and congeners with titers as low as 3 μg/L were isolated from fermentations up to 3400 L [15, 45, 46]. The ΔptnR1 and ΔptmR1 mutant strains of S. platensis MA7339 and S. platensis MA7327 discussed above significantly improved PTM and PTN titers but suffered from poor sporulation, thereby limiting their genetic amenability for further metabolic pathway engineering efforts. To overcome these challenges, genome mining and strain prioritization by a high-throughput RT-PCR method identified six alterative producers that were genetically amenable . The six alternative producers, with varying growth characteristics, all contained the ptm gene cluster and were confirmed to be PTM and PTN dual producer that produced PTM and PTN in titers similar to the S. platensis MA7327 and S. platensis MA7339 strains . Inactivation of the pathway-specific repressor, ptmR1, in the six alternative producers led to significantly higher PTM and PTN titers (up to 310-fold over the wild-type strains), with three of the ΔptmR1 mutant strains exhibiting excellent sporulation. The ability of nature to produce a targeted natural product across multiple strains can be exploited, using genome mining, to identify alternative producers that are amenable to genetic manipulation, as exemplified by PTM and PTN. This now provides an excellent biotechnology platform to apply the metabolic pathway engineering and synthetic biology principles to the PTM and PTN biosynthetic machinery for further titer improvement and structural diversity. Indeed, upon medium and fermentation optimization, PTM titer by the ΔptmR1 mutant strain of S. sp. SB12026 was enhanced to ~ 1.6 g/L, allowing for the isolation of 45 g of PTM from a 60 L fermentation [34, 37]. Access to a genetically amenable producer for metabolic pathway engineering and combinatorial biosynthesis allowed the generation of additional mutant strains in the ΔptmR1 background, including the ΔptmB1, ΔptmB2, and ΔptmO4 double mutants, which together resulted in the production and isolation of 28 PTM and PTN congeners [9, 34]. This demonstrates how genome mining can be judicially applied to exploit nature’s evolutionary power for alternative producers to overcome challenges related to natural product discovery and production. Moreover, identification of alternative producers that are genetically amenable allow for the engineered production of designer structural analogs within the targeted natural product scaffolds. The enediyne family of natural products, the first structure of which was elucidated in 1985 , is best known for its unprecedented molecular architecture and phenomenal anticancer activity. As of 2015, 11 enediyne natural products had been discovered by the traditional natural product discovery program (i.e., in contrast to the contemporary genomic-based natural product discovery program) [24, 44]. Basic and translational studies of this class of natural products and development of them into clinic drugs have been impeded by the small number of producing strains, lack of genetic amenability of the producers, low titers, instability of the enediynes, or a combination thereof . Genome mining for alternative producers and new producers, encoding the biosynthesis of new members of the enediyne family of natural products, provided an outstanding opportunity to overcome these pitfalls. Bioinformatics analysis of the known enediyne biosynthetic gene clusters revealed a minimum of five genes that were common among all 11 enediynes known to date. These five genes, E10/E/E5/E4/E3, which encoded the so-called enediyne polyketide synthase (PKS) cassette, were used for strain prioritization and targeted discovery of new enediyne natural products [35, 53]. A high-throughput RT-PCR method was used to screen 3400 actinomycetes for the enediyne PKS gene cassette, resulting in identification of 81 hits that could be further grouped into 28 clades on the basis of the sequence similarity of the enediyne PKS cassettes . Upon examination of the 28 clades, it was realized that four producers grouped together with Streptomyces globisporus, the known producer of C-1027 (Fig. 5a). Sequencing analysis of representative strains confirmed that they harbored the C-1027 biosynthetic gene clusters, and fermentation optimization of all four strains resulted in the production of C-1027 in titers of up to 67 mg/L of the C-1027 chromophore or 900 mg/L as the C-1027 chromoprotein complex, representing an 11-fold increase over the C-1027 titers from the original producer S. globisporus (Fig. 5b) . On the basis of the successful C-1027 titer improvement by manipulating regulation of C-1027 biosynthesis in S. globisporus [5, 6], applications of similar strategies by manipulating the pathway-specific regulators sgcR and sgcR1 in these newly discovered alternative producers promise to further improve C-1027 titers. Since the C-1027 biosynthetic gene clusters all reside on extrachromosomal linear plasmids and possess high similarity among the alternative producers [27, 47, 54], comparative analysis of C-1027 biosynthesis and production among the alternative producers provides an outstanding platform to study the regulatory networks between the biosynthetic gene clusters and the genomic background of the hosts. This may shed light on the different regulation systems in each host and how these systems interact with the same biosynthetic gene cluster, thereby guiding further efforts in selecting heterologous hosts and optimizing medium and fermentation conditions for natural product discovery and production. Further analysis of the 28 clades also led to the identification of Streptomyces sp. CB03234, which was predicted to encode the production of a new ten-membered enediyne . Genome sequencing of S. sp. CB03234 indeed unveiled a distinct enediyne biosynthetic gene cluster, and fermentation optimization of S. sp. CB03234 ultimately resulted in the discovery, production, isolation, and structural elucidation of TNM A, a new member of the anthraquinone-fused enediyne family (Fig. 5c). Two members of the anthraquinone-fused enediynes are known, dynemicin, isolated from Micromonospora chersina , and uncialamycin, isolated from Streptomyces uncialis . Manipulation of anthraquinone-fused enediyne biosynthetic machinery, however, has been challenging due to the lack of an expedient genetic system, low titers, or inability to produce the enediyne by submerged fermentation . In contrast, S. sp. CB03234 is genetically amenable, as exemplified by the ΔtnmH mutant strain that accumulated two new TNM congeners . Streptomyces sp. CB03234 therefore provides an excellent biotechnology platform to study anthraquinone-fused enediyne biosynthesis and engineer the TNM biosynthetic machinery to access other members of the anthraquinone-fused enediyne family of natural products and generate designer analogs. The enediyne PKS gene cassettes were applied to mine the microbial genomes available at Joint Genomics Institute (JGI) and NBCI for enediyne gene clusters, leading to the identification of Micromonospora yangpuensis DSM 45577 that harbored yet another distinct enediyne biosynthetic gene cluster predicted to encode a new member of the anthraquinone-fused enediynes . Fermentation optimization of M. yangpuensis DSM 45577 resulted in the discovery, production, isolation, and structural elucidation of YPM A, thus further expanding this family of natural products and allowing for structure activity relationship (SAR) comparisons (Fig. 5c). Taken together, these examples highlight the power of modern bioinformatics tools, which, together with the ever-increasing available genomic data and fundamental knowledge governing natural product biosynthesis, allow the exploitation of the diversity generated by nature to discover alternative producers with favorable growth characteristics and new strains enabling the targeted discovery of natural products with a desired scaffold. LNM, first discovered in 1989 from Streptomyces atroolivaceus S-140 [12, 14], is a hybrid peptide-polyketide natural product featuring an usual 1,3-dioxo-1,2-dithiolane moiety (Fig. 6a) . LNM has shown to be active against tumors that are resistant to cisplatin, cyclophosphamide, doxorubicin, and mitomycin . Inspired by its unprecedented structural features, the potent antitumor activity, and the novel mode of action, the 61-kb lnm gene cluster, consisting of 27 genes, was identified and cloned from S. atroolivaceus S-140 and sequenced [7, 43]. Extensive genetic and biochemical characterizations of the LNM biosynthetic machinery led to the discovery of two domains, an unknown function (DUF) and a cysteine lyase (SH) within the last PKS module of LnmJ, which were responsible for sulfur incorporation into the 1,3-dioxo-1,2-dithiolane moiety of LNM [26, 43]. Strikingly, since the discovery of LNM nearly 30 years ago , no other member of the LNM family of natural products has been reported. The latter motivated us to exploit the diversity nature may have already generated, by genome mining for pathway-defining features, to discover the LNM family of natural products. The LnmJ-DUF–SH didomain was used to mine over 50,000 bacterial genomes available at JGI, NBCI, and The Scripps Research Institute for producers of the LNM family of natural products, resulting in the identification of 49 strains, all of which harbored an LNM-like biosynthetic gene cluster, featuring a LnmJ-DUF–SH didomain homolog (Fig. 6a) [26, 31]. The 49 strains could be further prioritized based on the sequence similarity of the LnmJ-DUF–SH didomain homologs, affording 18 groups . 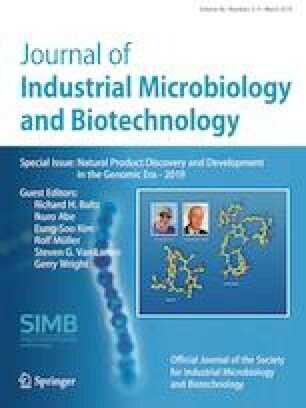 Fermentation optimization of representative strains from each of the 18 groups led to the discovery, production, isolation, and structural elucidation of guangnanmycin (GNM) A and B from S. sp. CB01883 and weishanmycin (WSM) A1, A2, and A3 from Streptomyces sp. CB01883, respectively . The GNMs and WSMs are new members of the LNM family of natural products that apparently have been hidden in plain sight without being uncovered by traditional natural product discovery programs (Fig. 6a) . Comparative analysis of the LNM, GNM, and WSM biosynthetic machineries, together with biochemical characterizations of substrate specificity of other representative LNM-like biosynthetic gene clusters from the 18 groups, enabled the mapping of the 18-membered hybrid peptide–polyketide macrolactam scaffolds for the LNM family of natural products, showcasing once again nature as the best combinatorial biosynthetic chemist to generate natural product structural diversity. The modularity seen in nature could certainly be exploited, where one could imagine mixing and matching the different modules from known LNM scaffolds to further expand the structural diversity of the LNM family of natural products (Fig. 6b) . Advances in DNA sequencing, bioinformatics, and metabolic engineering have tremendously impacted natural products’ chemistry. However, their full potential has not been realized due to the many challenges that remain within the field. The lack of knowledge governing the complex biology that regulates secondary metabolism has prevented metabolic engineering from reaching the predictability seen in other branches of engineering. This gap is highlighted in the three case studies provided here using FDM, iso-MGS, and PTM and PTN. These examples demonstrate that (i) regulators within the gene clusters and their interactions with the hosts play key roles in activation and transcription of the gene clusters, (ii) different heterologous hosts and their endogenous regulatory networks may have varying responses to a given biosynthetic gene cluster, hence yielding different levels of gene cluster activation and natural product production, and (iii) the regulatory hierarchy for a given cluster might be more complicated than currently appreciated, forced disruption or activation of which may lead to staggering or stalling of the biosynthetic pathway, thereby accumulation of side products or shunt metabolites. To overcome these challenges, we can look to nature for inspiration. Advances in DNA sequencing and genome mining approaches have allowed for targeted discovery of natural products. Identification of alternative producers has afforded strains with high titers, addressing the practical supply of valuable natural products, as exemplified by C-1027, and strains with the desired growth characteristics, allowing the application of metabolic pathway engineering principle to improve titer and generate structural diversity, as exemplified by PTM and PTN. Comparative studies of the gene clusters from a given family of natural products have made it possible to exploit nature’s biosynthetic potential to rapidly expand natural product structural diversity, as exemplified by enediynes. Genome mining for pathway-defining biosynthetic features has demonstrated the feasibility of discovering natural products with targeted scaffolds, as exemplified by LNM. These newly identified strains could in turn provide the opportunities to learn from nature how to optimize the cross talks between the host and the gene cluster to achieve high titers and how to exploit modularity for combinatorial biosynthesis for natural product structural diversity. Bridging the knowledge gap between the interactions of biosynthetic gene clusters, regulatory genes, and hosts should greatly facilitate the discovery, production, and isolation of natural products and their congeners. Tapping into the evolutionary power of nature will open new opportunities to further expand natural product structural diversity by metabolic pathway engineering, combinatorial biosynthesis, and synthetic biology. This would ultimately allow the development of a set of guiding principles for engineered production of natural products and their designers in genetically tractable and high producing chassis hosts. Research on natural product discovery, biosynthesis, engineering and drug discovery in the Shen lab is currently supported by NIH Grants CA106150, GM114353, GM115575, and the Natural Products Library Initiative at The Scripps Research institute. We thank the past and current members of the Shen Lab for their dedication, creativity, and contributions to research on natural product discovery, biosynthesis, engineering, and genome mining, and Guohui Pan, Jeffery Rudolf, and Andrew Steele for their critical reading and valued inputs to this review. This is manuscript no. 29761 from The Scripps Research Institute.